Raise your hand if you love pumpkin butter. 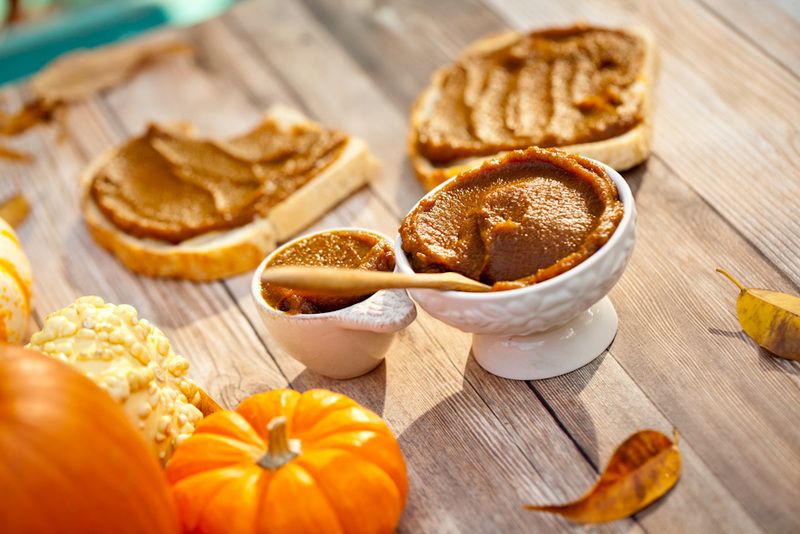 How about pumpkin butter with only 3 ingredients that’s naturally sweetened? *Begins clapping like a maniac. This is the time of year when I want to spread pumpkin butter on EVERYTHING. Toast, pancakes, biscuits, cinnamon buns, sundaes. You name it, I wanna put pumpkin butter on it and slather it on REAL THICK. Who am I kidding? Most of this pumpkin butter was eaten straight out of the jar with a spoon. It’s that good. I almost bought a jar of pumpkin butter from Trader Joe’s the other day. It looked good, but one of the main ingredients was sugar. So I set about to create my own version, using only dates as a sweetener. I love dates. They’re basically the candy of the fruit world that just so happen to be high in fiber and potassium. THANKS NATURE. Deliciously simple pumpkin butter. Made with all natural ingredients and only 3 ingredients. Pour boiling water over the dates to soften for 3-4 minutes. Drain the dates, reserving 2 tbsp water. Place the softened dates in a food processor with the pumpkin puree and pumpkin pie spice. Process for 2 minutes until smooth. Scrape down the sides and a add pinch of salt, if desired. If the pumpkin butter seems too thick, add 1-2 tbsp water from the dates to thin it out. Store in a closed container in the fridge for up to 5 days. Pumpkin season is only here for another few weeks, let’s make the most of it! Celebrate all things pumpkin related and put this pumpkin butter on everything! Did you make this recipe and think of a creative new way to use this naturally sweetened pumpkin butter? Tell us about your creation in the comments! Or snap a pic to Instagram with the tag #carrotsandflowers so we can see what you came up with. We LOVE seeing your food pics y’all! To save this recipe for later, Pin the photo below. Follow us on Pinterest, Instagram, and Facebook so you never miss a recipe! We also have a new Youtube Channel where we’ll be sharing more awesome videos full of vegan goodness. Happy Halloween everyone! Do you know the carb count on this? I know I can read the can label in the store, but don’t know how to figure in the date sugar. TIA! France, 4 dates have 75 grams of carbs. So multiple that by 4 and you have 300 grams of carbs for dates. Pumpkin has 8 grams per cup. So for the entire recipe you are looking at 316 grams give or take depending on the size of your dates. Now you would have to divide the entire recipe by how many servings that makes to get your carb serving. If you are having a tablespoon on your toast it won’t be that bad.